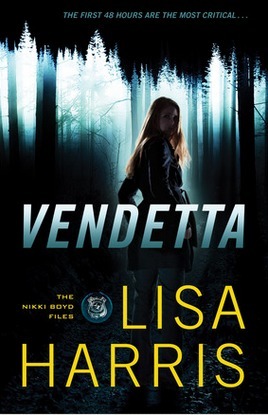 Review: Vendetta by:Lisa Harris | A Simple Life,really?! Nikki Boyd lost her sister when she was younger. No one ever found out her whereabouts and even recovered her body. Now many years later Nikki excels to do what’s right when someone is missing, after all its is her job. Being on the Missing Persons Task Force, she has seen many people go missing and most of the time she is able to help the families find their missing person. But one day when she is out climbing a mountain side, Nikki is called with and unusual case. The missing person is a teenage girl who went out to see the sunrise and never came back. But as the story unfolds, Nikki discovers they have an abduction on their hands. With everyone out scouting the area, she is unsure if they will ever find the girl. But as she gets closer and closer to the identity of the abductor, she discovers she may very well be next. Vendetta is book one in the Nikki Boyd Files. This book was an epic read all the way to the end. I can say I am excitedly awaiting the next book in this series. I really enjoyed this book and anyone who loves a good mystery will love this one for sure.